Becoming a pet parent always has its perks, especially when your pet doesn’t require any of the usual high maintenance care activities such as long walks or flea baths. 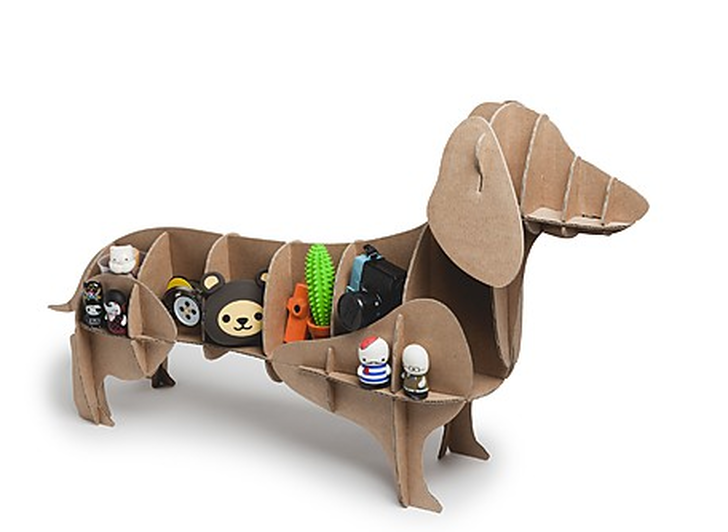 Skip over the fancy-pants pet store and set your paws on the Dachshund Cardboard Dog—a stationary knickknack storage solution complete with trays for storing keys, phones and more. This buddy in a box makes the perfect companion for “pet” parents always on the go. Build your new buddy with your own two hands, enjoy the convenience, of having cute canine decor that keeps track of your stuff -- instead of chewing it up! The Dachshund Dog is designed and manufactured in Madrid and might bark with a Spanish accent if you can get it to talk. Much like a real live dachshund (or weiner dog) the dachshund has a long narrow build and short legs. Give it a pat on your way in and out of the house and you’ll keep your useful cardboard pet plenty happy. 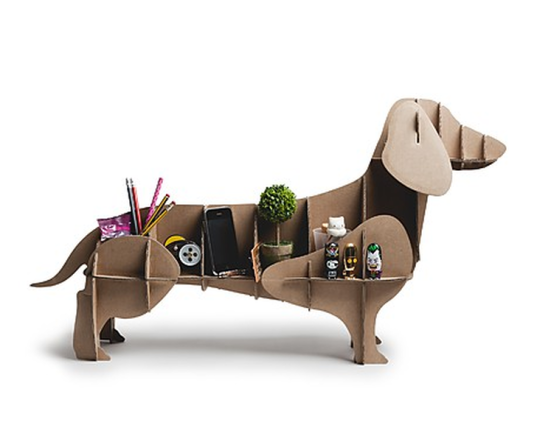 Assembly is a cinch, as this cute cardboard wiener dog comes in detachable pieces that are easy to store and transport. Though the dog is made of cardboard, it’s sturdy and solid as a rock and reinforced to provide rigidity. Your fur-less friend will run you a little over $38 USD and measures 33 inches in length, 7 inches in width and 18 inches in height. Get your hands on this unique product and learn more here. The Dachshund Dog is designed and manufactured in Madrid and might bark with a Spanish accent if you can get it to talk. Assembly is a cinch and comes in detachable pieces that are easy to store and transport. Though the dog is made of cardboard, it’s sturdy and solid as a rock and reinforced to provide rigidity. Much like a real live dachshund (or wiener dog) the dachshund has a long narrow build and short legs. Skip over the fancy-pants pet store and set your paws on the Dachshund Cardboard Dog—a stationary knickknack storage solution complete with trays for storing keys, phones and more. Your fur-less friend will run you a little over $38 USD and measures 33 inches in length, 7 inches in width and 18 inches in height.